2013... Yup it is in full swing! Summer post and Spring recap including PG Paddlefest! With high levels come big changes, the dinosaur bones that Al watched Jesus put in the Bowron to provide local boaters with eddy service have been swept away. But that didn't keep boats off the river as the Bowron’s boulder run is one of the good close to town runs for knocking the cobwebs off early season. The Willow on the other hand was a freight train with levels that are cleaning out the wood that since the last big flow have been perched above the heads of boaters for most of the season. Members of the brigade also hit the Quesnel while waiting for PG’s local runs to either have access or get to levels that are fun. An early season trip to hi the lower Q (and get a local boater back acquainted with Lucky) washed a few cobwebs off. And a solid run through “the eyebrow” with Norno shooting pics and leading the charge. The Gnarchako has seen boats as well. With low levels it has been great for beginners looking to hit moving water and test the rolls they worked on during the clubs annual pool session; which were a great success. The Quesnel crew has also been out and boating, hitting up a wave on the Necosli, running the lower Q and even getting some PG folks out for the Cottonwood. 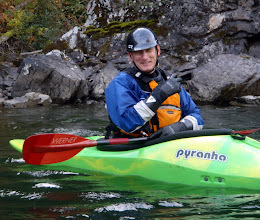 I had said that I would update the blog long before the annual PG Paddle Fest, but I didn't. So for those that couldn't or just didn't make it out here is the post trip report. Once again we headed out to the spectacular Robson Valley for Paddlefest! Wayne and Carol have yet to get sick of our company and provided the venue out at Loos. Unfortunatly this year a washout on the Morkil FSR prevented access to the run below the falls but that didn't slow us down. 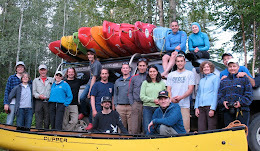 A good sized group managed to get out on the lower run and six of us paddled the canoe run (there was even a canoe!). After the Morkil both the Holmes and the Dore saw some action and a slightly delayed mission went off on the Goat. Well now that the catchin' up is kinda over it is Summer in PG! Play came and went on the Willow in some what quickly, but when it was in almost everyone came out. And our local SUP Guru, after notching up a bunch of SUP firsts in PG last season, managed to stick a shoveit... ya spancers ya'll best be lining up. 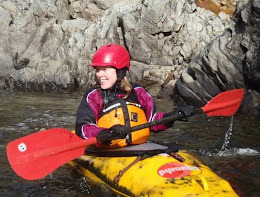 Paddling is on in PG, new boaters and old(er) boaters... make that more experienced boaters... have been getting out in kayaks and canoes, SUP on the river is happening and summer has only just begun!